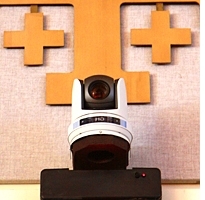 The church has a camera system that is able to record events in the church as well as provide a live feed or playback of DVD’s and powerpoint presentations to the narthex screens. The Camera Technology Team operates this system. serve as a consultant to prepare and run videos and other presentations in More Hall. Contact Tim Waris for more information.